Beach erosion is a threat to both properties and livelihoods of coastal communities. When the mechanisms of beach erosion are unclear, erosive shorelines are adaptively managed. The success of adaptive management depends on the interpretation of the archived data of each feedback loops. Archived data are limited or difficult to access in developing countries due to lack of budget, technical expertise, institutional coordination etc. Coastal management in Sri Lanka is well known as one of the pioneers in the field for its practices, governance and strategies. This paper deals with the historical shoreline change analysis and their subsequent management strategies as implemented to combat the erosion problems along a 6.5 km long shoreline of Southwestern coast. We did a temporal shoreline change rate analysis, temporal bathymetric change assessment (repeat cross-shore profile) and interviews to understand the erosion related problems from a multidimensional viewpoint. 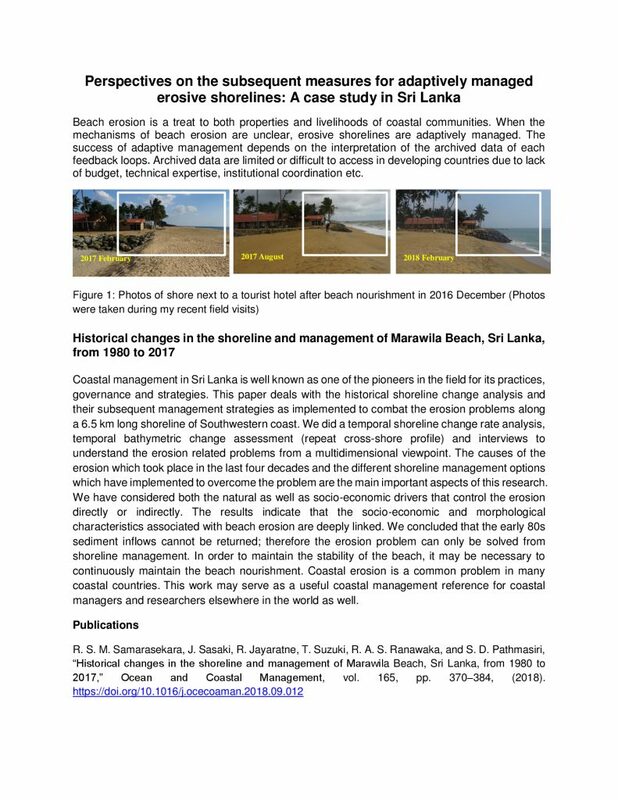 The causes of the erosion which took place in the last four decades and the different shoreline management options which have implemented to overcome the problem are the main important aspects of this research. We have considered both the natural as well as socio-economic drivers that control the erosion directly or indirectly. The results indicate that the socio-economic and morphological characteristics associated with beach erosion are deeply linked. We concluded that the early 80s sediment inflows cannot be returned; therefore the erosion problem can only be solved from shoreline management. In order to maintain the stability of the beach, it may be necessary to continuously maintain the beach nourishment. Coastal erosion is a common problem in many coastal countries. 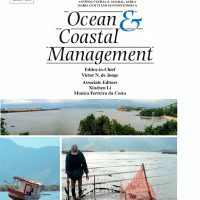 This work may serve as a useful coastal management reference for coastal managers and researchers elsewhere in the world as well.